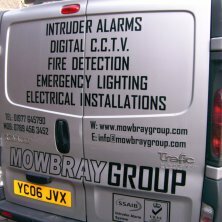 The Mowbray Group are a local company who have been specialising in a wide range of electronic security systems for your home and business for over 30 years, providing you with the experience, expertise and reliability you can depend on. Every system is designed to your personal needs and both equipment and installation are of the highest standard. Indeed, we are the ssaib (Security Systems Alarms Inspection Board) approved alarm installer in the West Yorkshire area, ensuring we meet all required British and European Standards. In addition, all mains electrical work is carried out in accordance with BS7671 as specified by the Institute of Electrical Engineers. So you can feel confident that when we call we will be providing the best possible equipment, installation, service and knowledge based on our many years of working in your local area and understanding the problems you face day-to-day.